My Passion For Decor: Our New Addition! No, we didn't have a baby or adopt a pet! Although a dog would be a wonderful addition to our family don't you think? That's not happening anytime soon with the Hubby's allergy to dogs! 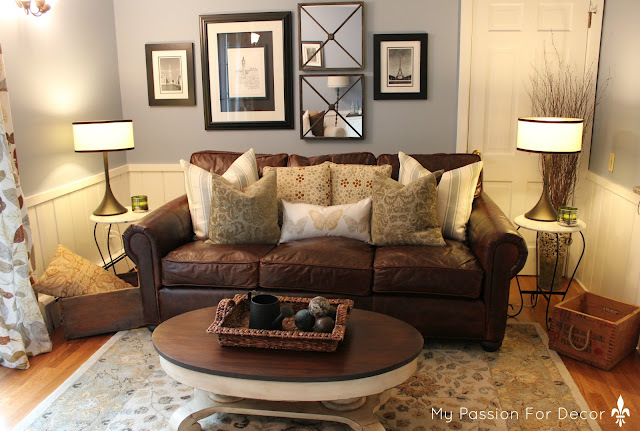 I mentioned our new addition a few blog posts ago....Our Restoration Hardware couch! Here's a picture of the new addition. The lighting isn't the best because it was pouring rain outside when I took this and had to turn on every light in the room! 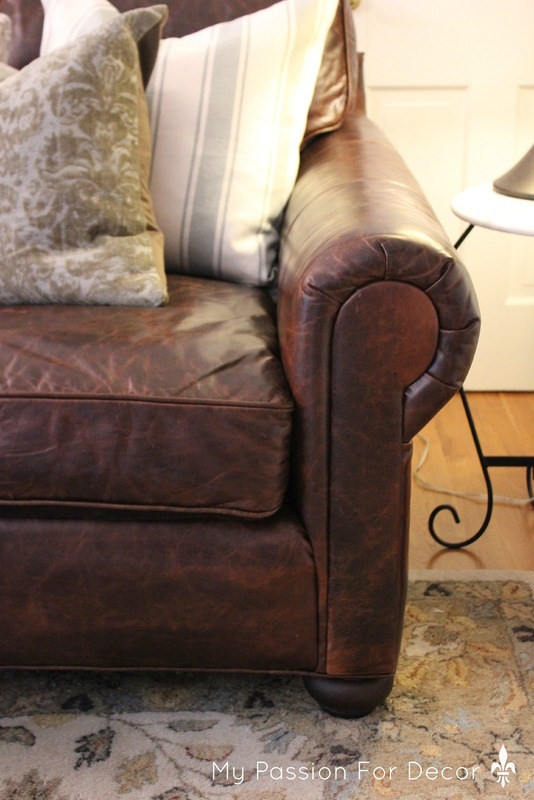 One of the things I liked about the couch was the lovely, soft and aged leather. I felt it was a good compromise for the both of us. If something gets spilled on the couch, just wipe it off! Also, I liked the classic details like the rolled arm and the wooden leg...not to mention the distressing on the leather! 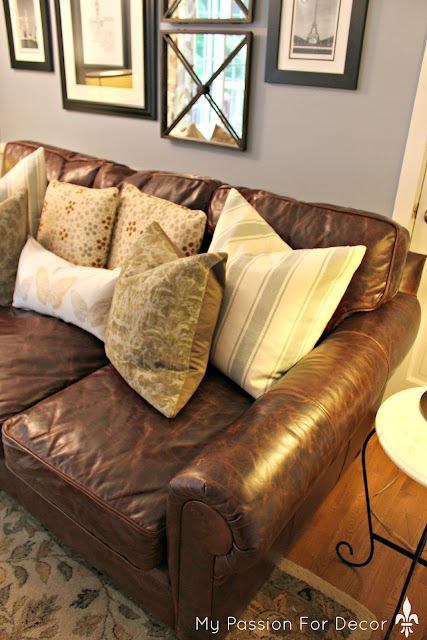 Now, you might be thinking, "Does she have enough pillows on that couch?!" And the answer is NO! It's so deep you need lots of pillows when you're short like me to nestle in and make your nest. Speaking of pillows....the pillows I had on our other couch weren't all working with the new couch. I've been searching for 2 weeks for pillow covers. I finally found these striped pillow covers last night at Pottery Barn. They used to be denim and they were used as floor cushions in the basement, now they have new covers and are a much needed addition to the new couch. I took this picture to give you an idea of the depth of this thing! I told my friend it feels like a twin bed and it really does. I am doing a room opposite of your colors - cream leather sofa and brown table. What color did you use on the walls? The color is Sherwin Williams Aleutian. Thanks for stopping by!! 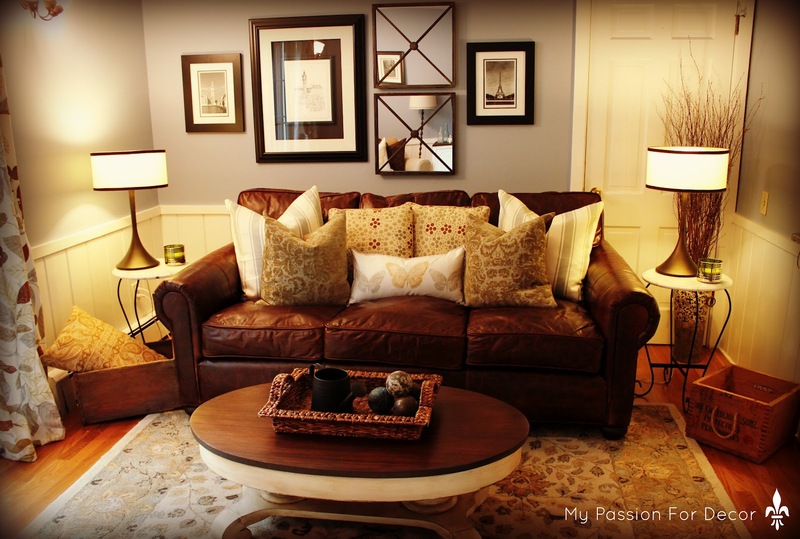 Your furniture is gorgeous - I am looking forward to following and seeing what you do next! I'm currently looking at Restoration Hardware for leather sofas too. I may get the petite one since they are so deep and my husband is not as tall as your husband. Love the leather you selected. Do you recall the color and style name of the leather? Hi Susan, our sofa is the 84" Lancaster in Italian Brompton Cocoa. 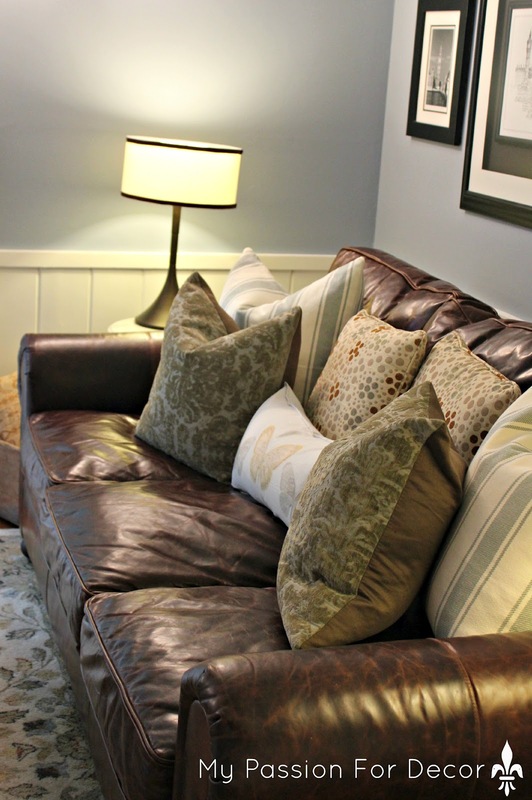 We chose the down filled cushions and yes the luxe 49" depth. If you don't need the depth, then by all means do the shorter...It's not easy for me to sit in without a million pillows, but great for the hubby!